A couple warnings appear before every episode. One clarifies that the racing in the episodes took place in a “controlled” environment and using “strict” safety protocols. The other is a Jackass-style warning that “just because we’re dumbasses” you shouldn’t do try this at home. But in the year 2018 it’s kind of ridiculous that this show still exists at all. 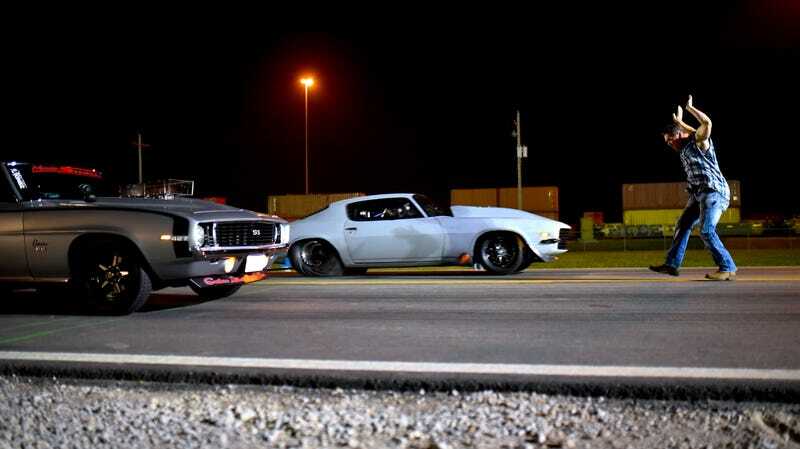 We’ve been railing against street racing basically since this blog began, and it seems like everyday we have a new example of how wrong it can go and how misguided it is. The reasons it is bad are pretty obvious: It’s dangerous for not only the drivers and the spectators, but also for complete randos. It wasn’t that long ago that a Mustang killed a mother and child in Florida, racing up to 102 mph. These dipshits get people killed. It’s also hard to have sympathy for people who spend thousands of dollars modifying their cars only to cry poverty when it comes to track entry fees. Anyway, Street Outlaws is still out here glamorizing it. There isn’t even a pretense of accepting risk to portray something real. The show’s stars—including JJ Da Boss, who’s spent time in prison—may be outlaws on the outside, but within the confines of the show they’re very much not. The show’s version of “street racing” is on closed roads, with everyone wearing a helmet, and all the cars have roll cages. This is a fake version of street racing sold as the same thing, as if there’s no real chance of getting somebody killed. That said, some of the outlaws do seem to be rough characters in real life, including head outlaw JJ Da Boss, who apparently will talk about his time in prison this season. JJ Da Boss was also sued in September by a fellow racer named Chad Larkin after an alleged incident on the Street Outlaws set. Larkin claimed he was repeatedly “kicked and hit about his head and body” by Day and his several of his associates after defending himself. He said that Day allegedly yelled: “F—- you fat boy, get your own show!” before he was attacked. The seasoned racer identified Day for the assault after being shown a six-person photo array. Larkin was ultimately hospitalized with a chipped front tooth, and also suffered a busted lip, black eye, herniated disk and torn left meniscus, the document states. Cool. Anyway, this show should not exist.